Often referred to as Gamro Cha, this tisane comes from a specific species of hydrangea plant found in the high-altitude mountains of South Korea (not the same as the flowers found in your backyard!). This medicinal herb steeps a light golden color with a natural sweet flavor that lingers in the mouth. 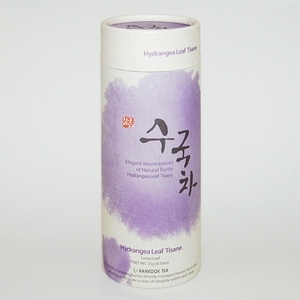 Shown to be effective for stopping cough, alleviation of fever and heart disease, it is also used as a natural sweetening agent (an alternative for sugar - safe for diabetics), hydrangea will purify and refresh the head and throat. Taste: Sweet with clean, minty feel that lifts up in back of mouth.